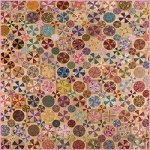 This beautiful quilt combines English Paper Piecing, traditional hand piecing and needle turn applique. 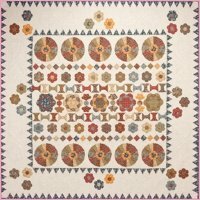 Duke Road by Sue Daley of Patchwork With Busyfingers is a 10 month block of the month that finishes 60'' square. It's only $19.99 a month. Timi Ann is Happy, Happy, Happy! Jo Morton stopped by the shop yesterday and today! Learn how to put the finishing touch on your quilt ... the binding! This class will teach you how to bind a quilt. It will cover straight, bias, 2-color binding and much more. Join M.J. on Sunday, Nov. 17, from 2 p.m. - 5 p.m. Enroll today.